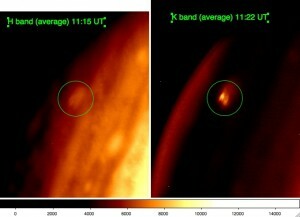 Last Sunday I posted on my blog an announcement about the possible recent impact on Jupiter atmosphere. I did not realize that a lot of my colleagues read this blog. On Sunday evening Paul Kalas, an adjunct professor at UC-Berkeley, but also a colleague and a friend, contacted me to let me know that he was observing at Keck Observatory and could potentially observe this feature. Over the night, we discussed and prepared the observations. Interestingly, Paul is in sabbatical in Crete (Greece), I was in San Francisco, and Mike Fitzgerald, recently hired professor at UCLA, was on the Big Island to conduct their observations. Their program was initially to detect the exoplanet Fomalhaut b but they managed to squizz as well some observations of Jupiter. It is when I woke up that I found out that they detected an anomalous bright feature at the same location than the dark sport reported by the Australian amateur astronomer Anthony Wesley from Murrumbateman (NSW, Australia). On Monday, I gave a talk to our REU students in the morning and then rushed in my office at SETI Institute to process the data. My apologize to my colleagues since I had to leave on the side all my other projects (writing grant proposals, reviewing a thesis) I am attaching the best frames that we got in Kp band (2.2 um). As you can see the scar has an interesting shape. One of our dilemma over the day was to check if it was real or not. 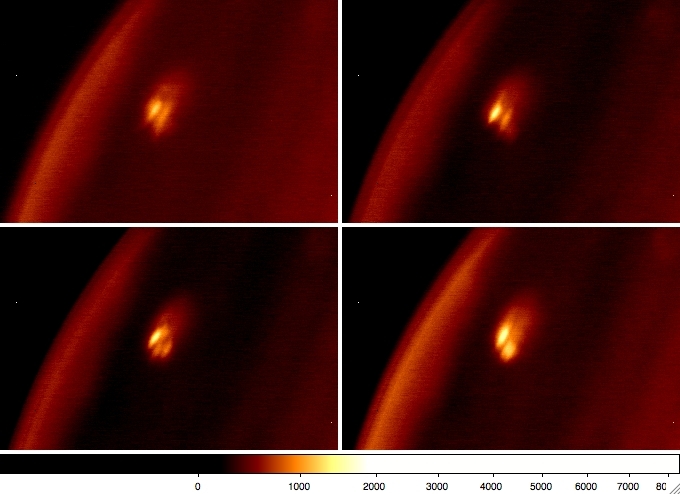 Our colleagues (Glenn Orton from JPL and his colleague) at IRTF also observed the feature and published a NASA-JPL press release during the day. On Monday night, I continued the data analysis and extracted from the H band frames (1.6 um) the same feature. Interestingly, it has almost the same shape (two or three bright peaks) confirming that they are genuine. We detected it marginally in CH4 filter at 1.6 um. Additional observations taken 4 h later by Mike Fitzgerald that I also processed over the night showed that there is no additional impact features on Jupiter. 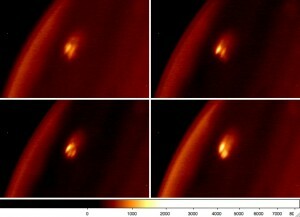 So whatever hit Jupiter this time was not a disrupted with multiple fragment comet like Shoemaker-Levy 9 (SL9). In the mean time, I posted the data for my colleague Mike Wong, researcher at STScI, who mastered the problems of deprojection and has a lot expertise in the study of Jupiter. He prepared a combined H+K map of the feature which allowed us to get its size and also its location. We confirmed that the position is similar than the dark feature seen in visible (305 +/- 1.5 deg west, 57 +/- 1.5 deg south in system III). We submitted an CBET circular which was published this morning (July 21) and into which we report the analysis of the observations. 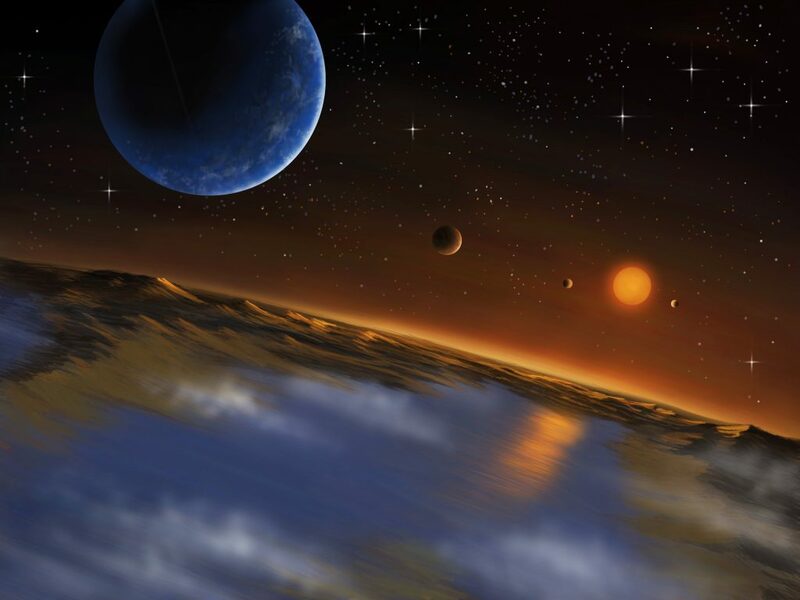 The PR officers at UC-Berkeley (R. Sanders) and at Keck Observatory (Ashley Yeager) wrote two press-releases: one is already published at Keck Observatory and a second one about to be released at UC-Berkeley (I will update this link in a few minutes). The entire project is a great team work and I am thankful that Paul Kalas and his colleagues considered to do these observations. I recently got questions from colleagues and journalists. Here a tentative answer to the most common questions. I must admit that I am not yet fully aware of the tons of publications which followed the SL9 impact. I was 22 years old, and a young guide tour (!) at the Pic du Midi when it happened, so I was not yet involved in astronomy. It will be definitely interesting to compare this impact with SL9 which happened exactly 15 years ago. Why didn’t we see it coming? The impactor may have been too small so too faint for our current instrument. If it is a small asteroid (less than 1 km in diameter) its brightness will be beyond the capabilities of current survey instruments. It is also possible that we were not looking in the right direction. This clearly justifies the need for whole sky survey to detect minor planets such as LSST or Pan-Starr. Is the Solar System a dangerous place? We should be thankful to have a large planet like Jupiter in our solar system. 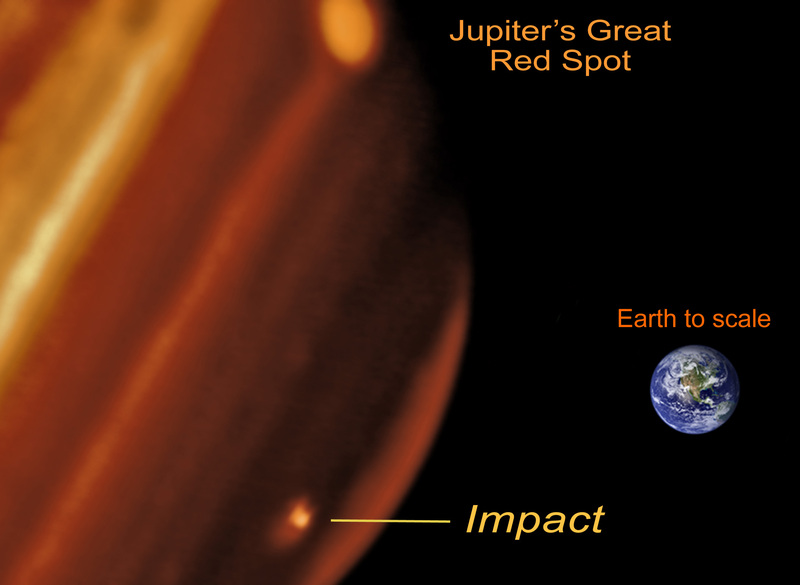 Jupiter is suffering for us receiving the impact of bolides coming from the outer part of the solar system because of its strong gravitational field. What kind of additional observations are planned? More obsevations are scheduled this week at Keck observatory, and most likely at Gemini North & South and the VLT. A lot of large aperture telescopes will contribute to this campaign. It is a revival of the SL9 campaign which was a very cheerful memory for our community. HST will also contribute and there is rumors that the brand new WFP3 will observe it soon. Imaging and spectroscopy studies in all wavelength range are needed. Stay tune! How often does this kind of event happen? This is a very difficult question, and I am not sure I can provide a response. It is evident that amateur astronomers are equipped with state-to-art cameras which should allow them to detect these events more often. 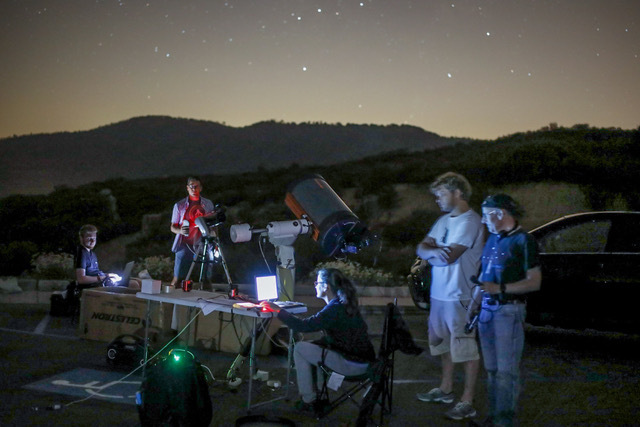 Because the planetary science community does not have a survey telescopes dedicated to observe the planets (unfortunately), we entirely rely on the contribution of amateur astronomers to detect these impacts. This is also true for detecting supernovae, recording lightcurve of asteroids and astrometric positions of near Earth asteroids.It is quite possible that over the last 15 years we have missed most of them. 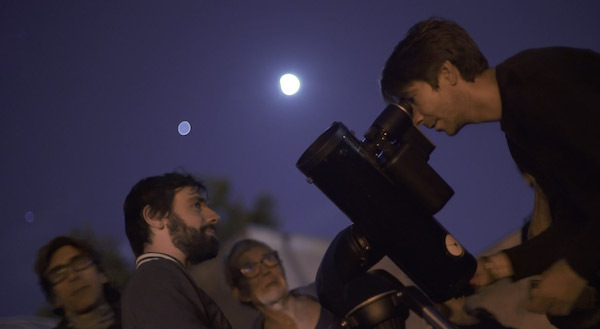 The future will tell us the frequency of these events, we need to keep the amateur astronomy around the world motivated to make sure that these Giant planets are often observed, not only for the science, but also for their beauty and for inspiring the young generation. Good for you, this was a great find!!! I cannot wait to share this with my Astronomy class in September! My best friend just moved back to Austrulia, glad to see she is in good company there!!! Keep your eyes in the sky!!! I’m wondering if a “small” object hit Jupiter then how it could leave such a large brusie. Thanks for sharing pictures. Having a Jupiter to soak up some potential impactors seems clearly better than not having a Jupiter, but I wonder how helpful it really is. Jupiter’s orbit is about 3 billion miles in circumference. 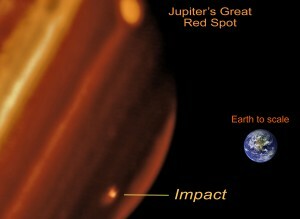 I suspect that potential impactor coming from the outer solar system and along the ecliptic would still have to pass within a few tens of millions of miles of Jupiter in order to be captured by it, so, even apart from objects coming at odd angles, wouldn’t Jupiter only be protecting us against just a few percent of potential impactors? I think that this bruise was caused by the main core of comet Shoemaker. The comet broke into parts on the first event but probly his core was intact and thrown out by the gravital forces, circled the Jupiter in a wide eliptical swing and came back to follow his destination into the planet. Véritablement très sympathique et instructif de tomber sur le blog d’un des acteurs principaux de cette découverte!